For those who are looking for SSS branch office and contact number in Balanga, Bataan, we have provided at the end of this article, the SSS Balanga Bataan Branch Office Contact Number and location address. This info was gathered from the website sss.gov.ph and re-posted here for easy access by those who seek this information. But before we get to the details, let us give you first a brief introduction about the city of Balanga in the province of Bataan. The name Balanga came from the word “Banga” or clay pot which was once made by townfolks in the area. In 1974, when Bataan was established as a separate province, Balanga was made the city capital by General Pedro Manuel Arandia because it is located at the center of the new territorial jurisdiction. On December 30, 2000, Balanga was inaugurated as a City by way of Republic Act 8984 authored by then Congressman Enrique “Tet” Garcia. Since then, the city demonstrated a high record of residential growth resulting in the large increases in population. At present, the city of Balanga enjoys a huge increase in commercial and employment activities. This prompted the city government to undertake a Master Planning exercise and various developmental projects that would further establish Balanga as a primary residential-agricultural city with a rapidly growing commercial and industrial sector. As proof of Balanga City’s continous economic growth, several major food chain companies have thriving business here and the number of rural and commercial banks, is continuously increasing. This only proves that Balanga city is a place for good investment and with the influx of many employment opportunities, there is now a need for a government agency that can provide better social security to the increasing number of private workers or employees. Written below is the address and contact number of SSS Balanga Bataan branch. 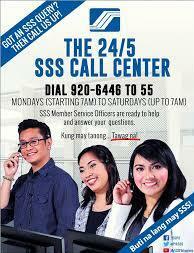 Including the SSS call center center number which is available to take your call 24 hours a day from Monday to Friday. We also included the telephone number of the OFW Contact Service Unit or CSU for all the Overseas Filipino Workers who to inquire to the agency about the services they offer. This entry was posted in Branches and tagged balanga, bataan, branch office, csu, inquiry, ofw. Bookmark the permalink.